Bushgarden Farm is a fifth-generation family farm located in the heart of the Rideau Lakes. It produces organic, raw-milk cheese by hand using milk from its herd of 20 Holstein and Brown Swiss Cows. 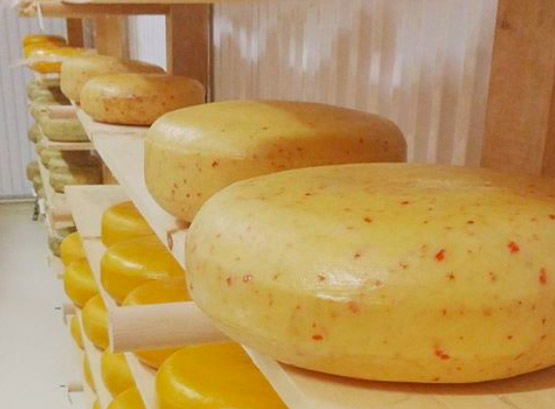 Bushgarden’s farmer and cheesemaker, Nigel Smith, specializes in two cheeses: Pilgrimage, a Gouda-style cheese that is the first raw cow’s milk cheese produced in Ontario in decades; and Nauvoo, an aged cheddar-style raw-milk cheese. Bushgarden has been farmed by the Smith family since the 1820s. The century farm’s dairy herd was certified organic in 2006 and in the winter of 2011, the family constructed a small cheese studio on the property so Nigel could get to work perfecting his raw-milk cheeses. Sample and purchase Bushgarden Farm’s cheese at The Great Canadian Cheese Festival. In all, there will be 150 Canadian artisan and farmstead cheeses on offer, plus 200 specialty foods, not-to-mention small-batch wine, craft beer and cider, and spirits.